We always keep complaining that most studies about Rheumatoid Arthritis (RA) focus only on the objective measures of inflammation & other factors rheumatologists are interested in. They hardly ever look at what a patient goes through, physically & mentally due to RA. Caroline Flurey & colleagues have just published a study that looks at Rheumatoid Arthritis from the patient’s perspective. The study consisted of interviews of patients with Rheumatoid Arthritis to understand how they manage their day-to-day life & cope with their ailment. The results have been startling. For us Rheumatologists, they are an eye-opener; letting us a sneak preview of what a RAer goes through. As a RAer, I am sure you can identify yourself as you go through the study results. Here is what the study revealed. I have also added links about remedial actions. 1) Most RAers experience RA as a constant background reality, often being aware of its presence & the limitations it brings. Life is all about micromanaging & macromanaging their symptoms & daily life so that it remains in the background & does not interfere much with daily life. 2) Learning & developing proper coping strategies (details in resources at the bottom of the post) can do a lot good & help keep RA in the background. The aim of any rheumatologist is to keep the RA in remission (background) & minimize the chances of a flare. 3) RA can be & is unpredictable. It can intrude into life in the form of a flare without any notice. A flare can reach a magnum proportion by the time one sits trying to make sense of the fluctuation. 4) Once in a flare, coping strategies do matter. Some try to regain control on their own, some seek medical help right away while some Leave it as the final option. 5) One of the best ways to better manage a flare is to keep a self-help plan ready in consultation with your Rheumie. We have discussed this in the past here on the blog. Let it roll as soon as a flare is recognised & seek a Rheumie appointment in the mean time. 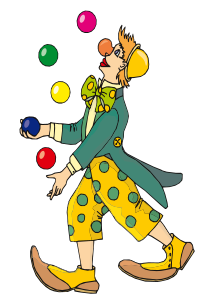 All in all, life of a #rheum patient is indeed a juggling act with a need to balance every aspect of life so as to keep RA & its impact in the background. DMARDs/ biologics, positive attitude & the right coping strategies help in this regard. In case, RA tends to overpower & come to forefront in form of a flare, there is no need to panic. Roll out the ‘flare plan’ immediately & push RA in the background again. 2) How to plan a house cleaning job with RA? 3) How to arrange the kitchen if you have arthritis? 4) Tips for painless cooking. More bad than good comes to one’s mind when steroids are mentioned, isn’t it? Steroids (Glucocorticoids) have been equated with all that allopathy has to offer for its arthritis patients. It is thought that each & every patient consulting a Rheumatologist would be on long-term steroids irrespective of his diagnosis & would invariably end up with side effects. Glucocorticoids (popularly known as steroids) were discovered by Scientist Hench. It was a path-breaking discovery & Hench was awarded the Nobel Prize for this in 1950. Steroids when introduced were used for Rheumatoid Arthritis (RA). As expected they had miraculous results. It was thought that a cure for Rheumatoid Arthritis was in the making. Variable doses were given for variable duration as everyone was on a learning curve. Soon, the side effects were realised. Search began for better medications. This resulted in the development of DMARDs & later biologics that have revolutionized the treatment & outcome of Rheumatoid Arthritis. Not just new drugs, but treatment strategies such as ‘treat to target’ were developed to ensure remission in RA. So then, if not for steroids, how is RA treated now? RA is now treated with a target of remission (absolute control of arthritis) right from day 1. Patients are started on DMARDs; generally a combination with Methotrexate as the anchor drug. The DMARD doses are stepped up with the aim of achieving remission asap. If the patient fails to show a good response by six months, biologics come into the picture. What about steroids in that case? What is its role? Steroids are given to begin with as a bridge till the time DMARDs have their effect. This would mean a small dose of steroid for 4-6 weeks. 5) An occasional patient who has persistent active arthritis despite DMARDs & cannot afford biologics. All in all, steroids have a well-defined role & use as far as Rheumatoid Arthritis is concerned & one does not have to be on long-term steroids unless for some specific indications. Suffering from a chronic ailment? I am sure you must have come across numerous ‘magic cure’ claims. 1) Herbal medicines – specially brought form the Himalayas & the Alps & can cure arthritis. 2) Massage beds – claimed to cure every disease under the sun! One has to sleep on the bed for 30 minutes. It does not matter whether you have arthritis/ kidney ailment/ cardiac ailment/ deviated nasal septum. The bed cures all! I wonder why we need so many specialist doctors, MRI, blood tests. We could have done better with a hospital with these beds everywhere. No consultation with a Doctor, no scans, no blood tests. Just come to the hospital, lie down on the bed & you will be cured of all diseases!! 3) Herbal oils – celebrities hosting TV shows that have people claiming that these oils cure all arthritic ailments! Not just arthritis, they can (as per the claim) even prevent surgeries after trauma! 4) Toxin removal therapies- Proponents of this therapy feel that one gets various diseases due to toxins & the therapy is to rid the body of these toxins. But then, can one measure these toxins? – oh no, they are invisible…no blood tests to measure these toxins are available. How can one be sure that the toxins are removed? Oh sorry, paying the fees is the guarantee enough that toxins are removed from the body. This reminds me of one of my patients with Rheumatoid Arthritis. She was on herbal medicines & did not improve. She was started on DMARDs & improved significantly. She happened to meet the earlier herbal medicine person, as he was her family friend. She was told that she has improved but her body was full of toxins associated with allopathic arthritis medicines (DMARDs) & should undergo a course with him to remove the toxins! That means; going by his logic, what helps the body is a toxin! 4) Magnets – they can cure everything. I wonder how on earth; the biggest magnet can’t cure people’s ailments. May be a few of these claims are true. Let me not be biased. In that case, how do you & I decide whether these claims are true? Let us understand how ‘evidence based medicine’ works to understand this better. This is exactly how a new drug, technique & even a treatment strategy is scientifically approved. So, then in that case, when we see such magic claims, why not ask ourselves a few questions? 1) Is there any study comparing the magic claim with standard practice medicines? In the absence of such a study, it is impossible to conclude which one is better. 2) If there is a study, is it published in a reputed medical journal? If it is published, this would be a robust proof of its authenticity. A study published in a journal is reviewed by experts & can be relied upon. You can check if the journal is reputed by its impact factor (http://impactfactor.weebly.com/) . 3) Please note that awards & celebrity endorsements cannot replace published studies. It is an attempt to say ‘ I do not have studies to back my claims, this award/ celebrity is a gimmick you will surely fall prey to’. 4) There is hardly any reputed Physician who will claim ‘guaranteed cure’, ‘advance payment of entire course fees’. 5) Testimonials – useless unless backed by proper study. In scientific language these are called anecdotal reports & do not amount to hard evidence. For eg, stem cell therapy for Rheumatoid Arthritis. A few patients had dramatic improvement & were reported (anecdotal reports). However, many more had no improvement or probably had side effects. For obvious reasons, they were not reported in journals. We can conclude about the efficacy only when many patients are recruited in a study & compared with patients receiving standard treatment. 6) Are the contents of the medicines clearly mentioned & is a prescription provided? We come across patients taking unknown herbal powders for Arthritis. Chemical analysis reveals the presence of steroids & analgesics in many of them. As a patient you surely have a right to know the contents & the reason why they are prescribed. So, the next time you come across magic claims & cures; make sure that you answer these questions yourself before taking a decision. 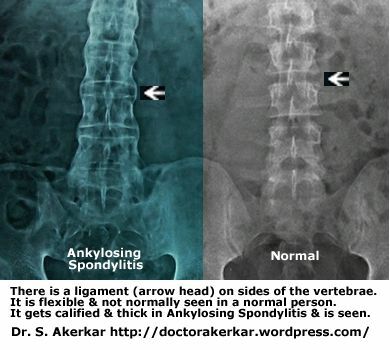 How does Ankylosing Spondylitis progress? Whenever one speaks about Ankylosing spondylitis, I’m sure picture of a man with a hunchback & restricted mobility comes to your mind. This famous photograph from the ACR library clearly describes what a patient with Ankylosing spondylitis goes through in his life. Ever wondered what really happens behind the curtain? Ankylosing spondylitis is a chronic inflammatory arthritis affecting the sacroiliac joints (joints beneath the buttocks), vertebral joints & the hips. The joints get inflamed & persistent inflammation in the long run leads to formation of new bone. The inflammation is responsible for the pain & the bone formation leads to restriction in movements of the spine. Let us have a look at a simple example to understand this. 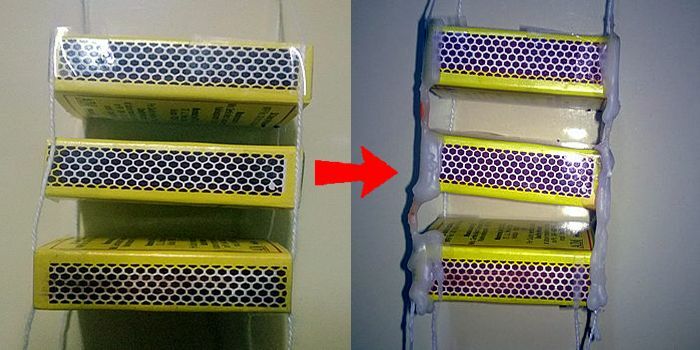 The spine is similar to multiple matchboxes hung by a set of flexible threads. The flexibility of the threads is responsible for the movements of the spine. However, if you put wax on the threads & let it set, the threads do not bend. 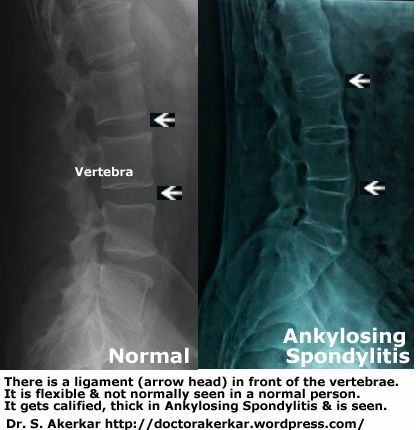 This is exactly what happens with Ankylosing Spondylitis. The threads are akin to the ligaments of the vertebrae & the matchboxes to individual vertebrae. Once the threads become hardened by inflammation (wax) the mobility is lost. The hardened ligaments give the typical tram track or bamboo spine appearance on the X-Ray. It is almost a year since the Mumbai Arthritis Clinic App for android was launched. It has had a phenomenal response with more than 2000 downloads & 50 reviews. It has been rated the best lupus app by Laptop magazine & an average score of 4.5 out of 5 on google play. We would like to help more lupies with the app & are all set to launch an iOS version soon. The app is designed around you & would like to have your suggestions for inclusion in the iOS version. Have a quick look at the previous blogpost about the features of the android app. Please help us design a better app for iOS. 3) Make a note of questions you want to ask your Rheumatologist. 4) Store all the important snaps (eg. a rash that you have) for showing it to your Rheumatologist later. Kindly post your suggestions (however silly, weird they may sound) so that they can be incorporated in the app.